Unbeknownest to the Apostle Paul, his short stay in Troas (modern name: Eski Stambul) in the spring of 58 A.D. would cause one of the rarest, yet most powerful, miracles to be recorded in the Bible. It would be generated in response to an accident which took place while he was preaching late into the night. God graciously granted Paul the ability to resurrect someone from the dead! This resurrection would become the tenth and last time such an awesome act of mercy would be recorded in Scripture. During his third missionary journey Paul sailed to Troas on the Asia mainland. He stopped for a short time in the city with the desire of adding new converts to the Church, and to impress deeply, on those who were converted, the truths and the duties of Christianity. Troas was a place, like Corinth, Ephesus, or Thessalonica, where the Apostle must have wished to lay firm and strong foundation of the Gospel. Paul's last few precious hours among the brethren in Troas are recorded in Scripture. In order to maximize his time with the church, he continued preaching and teaching after the Biblical Sabbath, which fell during the Days of Unleavened Bread, had ended at sunset (Acts 20:7). He continued to teach Saturday evening even as the group was partaking of a meal. Ten people resurrected from the dead! The church at Troas had assembled on the third floor of a building in order to hear Paul teach. The room itself had at least one recess or balcony (window opening) that overlooked the street below. It was late at night as many lamps were burning in the room where the congregation was assembled (Acts 20:8). The place was warm and crowded. Apostle Paul, with the feeling strongly impressed on his mind that the next day was the day of his departure, was continuing in earnest discourse even till midnight. Paul's long Bible study into the night had taken its toll on Eutychus, a young man listening to him speak. Overcome with exhaustion and weariness, Eutychus sank into a deep slumber as he was seated or leaning in the balcony. He then, without warning, accidently fell to the street below and died instantly (Acts 20:9). Confusion and terror followed, with loud lamentation. Paul was enabled, however, to imitate the resurrection power of that Master whose doctrine he was proclaiming. As Jesus had once said (Matthew 9:24, Mark 5:39) of the young maiden who was taken by death, "the damsel is not dead, but is sleeping," so Paul also received power to resurrect that which was dead. Paul went down and fell upon the body of Eutychus, like Elijah and Elisha of old (see 1Kings 17:22, 2Kings 4:32, 34, 36). To everyone's surprise and astonishment, the young man had his injuries healed and he was resurrected back to life! But Paul went down and laid himself on him, and embraced him, and said, 'Do not be anxious, for his life is in him.' And after he got up again, and had broken bread and eaten, and talked for a long time . . . (Acts 20:10 - 11, HBFV). On Sunday morning it was time for the congregation to separate. It should be noted that Paul did not stay or conduct a church service on Sunday since the Biblical Sabbath, from Friday to Saturday sunset, was not abolished in the New Testament. Since he had already kept the Sabbath the day before, there was no need for him to rest or remain in Troas. The resurrection back from the dead, in Troas, is one of the rarest miracles in the Bible. It is the only one, according to Scripture, that the Apostle Paul performing. Only ten people have been documented to have been resurrected back to a physical life (Christ was brought back to life as a Spirit Being). 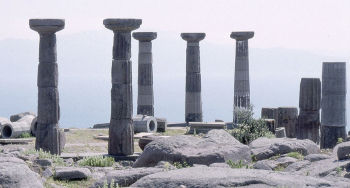 Paul leaves the city on Sunday morning and begins his long walk to Assos (Acts 20:13) where he will meet his other traveling companions and continue his missionary journey.